There was a time when pressure cookers were unwieldy and required a lot of supervision to maintain the pressure. Yet, they were quite popular because of the ease with which they could cook food and the fact that they retain most of the nutrients in the food; then came the era of microwaves when everyone started switching to these new electrical devices. But pressure cookers are making a comeback as newer and better products enter the market. One of the most interesting categories of these kitchen utensils are the small pressure cookers. The small pressure cookers are similar to the larger counter parts, but miniature in size. Typically most of the popular brands will make a small pressure cooker in every series of products they release in the market. These cookers would have similar design, safety features and even the technology – the only that changes is the size. Pressure cookers which have a capacity of around 4 quarts are considered to be small, while anything ranging from 6 quarts to as high as 10 quarts would fall in the medium to large range. The small pressure cookers are ideal for a bachelors, single adults, college students and even couples. The capacity of the cook is just right to cook for 1-2 people. A good thing about these cookers is that due to their small size, they can be easily stored in the kitchen. Despite all the advancement in pressure cooking technology, one thing that manufacturers cannot really change is the size of the unit. A 10 quart cooker need to have a certain weight and size to support that kind of volume. These large cookers can become tough to handle and store. The small cookers are perfect in this regard. Like any cooker, the small cookers are also available in aluminum or stainless steel. The aluminum cookers are lighter but are not dishwasher safe. On the other hand, the stainless steel cookers are relatively heavier, but can be cleaned easily even in dishwasher. 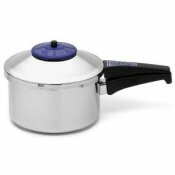 Some of the latest models of pressure cookers come with anodized aluminum material which is tough, durable and resistant to scratches and stains. 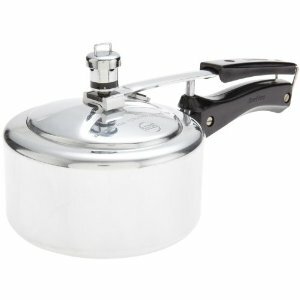 Classic Aluminum Pressure Cookers by Hawkins is consider the smallest. With 1.5 liter, this small pressure cooker cooks everything thoroughly. One thing that you must remember about these small cookers is that due to lack of space, they cannot be used to cook two different foods simultaneously on most occasions. The larger cookers tend to have a mesh or some other accessory that can be used to double the cooking in a single go. With small pressure cookers you may be challenged to achieve similar results. If you are a working adult or a college student who just cannot find time to prepare meals and relies on buying food outside, the small one is just what you need. Thanks to all the advancements in the cooking technology, you now need to just keep the food in the cooker and forget about it till the specified time duration. You can finish the rest of your dinner, listen to music or finish your other chores while the cooker is getting your nutrient rich home-cooked food ready to eat. This is a much safer, healthier and economic option to eating outside. Pretty soon you should be sitting a bunch of spare cash that you were wasting at the fast food centers. Despite all these benefits many people are still apprehensive about cookers because it takes them a lot of time. Well most cooker brands today offer you a recipe booklet with your small pressure cooker. This will have just the right menus for a wholesome lunch of dinner made using pressure cooker. Pretty soon you will find that the pressure cooker is actually faster than your microwave too. Besides, once you get used to eating freshly cooked healthy food, chances are that you will not go back to your frozen readymade dinners again. They are good when you do not have a choice, but when a small pressure cooker choice is all yours. In conclusion, small pressure cookers are one of the most popular cooker models in the market. They are simple to operate, easy to store, light weight and yet very effective in cooking food quickly. They are ideal for the modern fast life for single working adults as well as students.